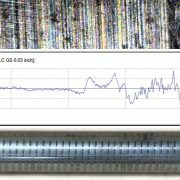 You are here: Home › news-press-releases › How is Cold Drawn Steel Made? How is Cold Drawn Steel Made? There are many benefits to using cold drawn steel as compared to hot rolled steel, including better machinability, higher mechanical properties (yield & tensile strength), smoother surface finish, and better size, roundness & straightness control. Round cold drawn steel bars can be produced as small as 0.125″ or even less, to as big as 6″ diameter. 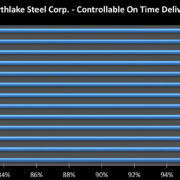 Each producer has their own limitations on size, but Northlake Steel is proud to be able to produce cold drawn rounds up to the 6″ maximum allowable per the (ASTM A108-13, Standard Specification for Steel Bar, Carbon and Alloy, Cold-Finished, ASTM International, West Conshohocken, PA, 2013, www.astm.org) specification. On occasion we have drawn even larger diameters, for special applications which require cold drawing for increased mechanical properties. For most cases though, any bars over 6″ will be cold finished by turning or centerless grinding. In a nutshell, cold drawing is the pulling of a hot rolled steel bar through a die that is slightly smaller in size. So how is cold drawn steel made? 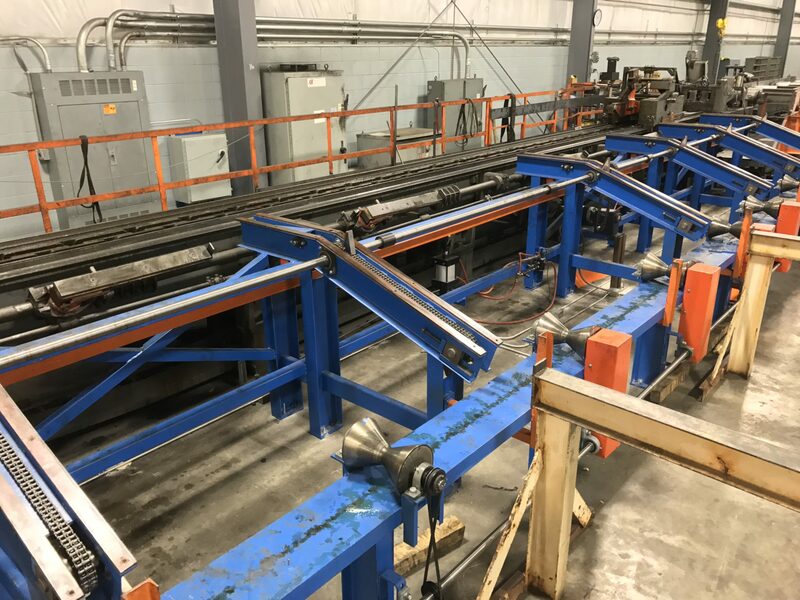 The process path that Northlake uses consists of first shot blasting the hot rolled bar, then cold drawing it through the die, then rotary (roll) straightening, and finally cutting to length. This initial operation will clean the surface of the hot rolled bar, essentially removing all scale and rust. This operation also creates a bar surface which will help carry the drawing lubricant into the die. The main operation, which actually produces the cold drawn bars. We use a heavy frame drawn bench which can draw out over 40′ long finished cold drawn bars. The die itself is mounted securely so as not to move during operation. A pusher mechanism will grab the bar and advance the first 12″ of the bar through the die. Next a buggy carriage will grab the portion of the bar that’s sticking out through the die. The buggy is attached to a large endless chain that is power driven and able to pull the buggy and bar all the way through the die. The standard “draft” is a 0.063″ reduction in diameter. A “heavy draft” is considered anything over 0.125″ in size reduction, and is used in 100K min yield strength products like ASTM A311-B (ASTM A311 / A311M-04(2015), Standard Specification for Cold-Drawn, Stress-Relieved Carbon Steel Bars Subject to Mechanical Property Requirements, ASTM International, West Conshohocken, PA, 2015, www.astm.org). 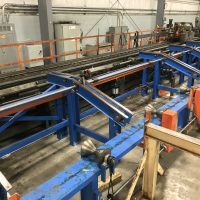 There are also certain grades of product which will undergo two or more passes, and depending on the grade would require an annealing process in between draws. After the drawing operation itself is completed, the bars will undergo a straightening operation. Straightness tolerances will vary depending on grade and size, and tolerances are called out in the ASTM A108 specification (see link and citation above). We can also hold tighter than standard straightness depending on the material upon request. The rotary straightening operation also improves surface finish and will help control size slightly. The final operation before packaging is saw cutting the bars to length. The end gripper marks left from the drawing operation are cut off. The bars are then cut to the required length. Standard cold drawn lengths are 12′, 20′, and 24′ long. We can provide up to 40′ cut lengths upon request. Cold drawn bars are packaged in bundles of 2,000# and 4,000# quantities. 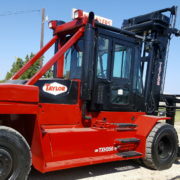 The bars also receive a coating of rust preventative and all bars are traceable and identifiable with tagging showing heat number, size, length, grade, product, weight, and Northlake lot number. 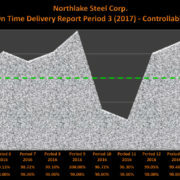 Our northlakesteel.com website has a wealth of knowledge and information available. Click here to learn even more about cold drawn and other cold finished bars. Watch the video below to see cold drawing in action!